Denis Crnkovic’s article, “On the Contexts of Edith Sodergran’s Russian Poem, ‘Tikho, tikho, tikho'” appeared in the Fall, 2018 issue of Scandinavian Philology (vol. 16, issue 2), published by the Scandinavian and Dutch Studies Department of the St. Petersburg (Russia) State University. Elizabeth Baer presented a paper at the American Comparative Literature Association Conference in Washington, DC on March 8. 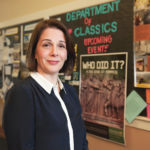 Entitled “Colonial Practice, Nazi Policy: Sexual Violence in German Southwest Africa and the Third Reich,” the paper represents new research built on her recent book, The Genocidal Gaze, which was published in the US in 2017 and in Africa in 2018. Julie Gilbert (Library) wrote a short story, “Colorblind,” that appears in Potluck: Creative Works by Minnesota Library Workers, an open access publication highlighting the Minnesota Libraries Publishing Project. The story considers questions of identity, race, and adoption and can be read here. Priscilla Briggs and Betsy Byers have work in a group exhibition at ICOSA Collective in Austin, Texas from March 1-30, 2019. The exhibition, “Driving South in a Mostly Straight Line,” was juried by Andrea Mellard, Director of Public Programs and Community Engagement for The Contemporary Austin and founder of Crit Group.